Yeah I don't mind losing but to lose with no effort on defense is just unacceptable. Turnovers don't make it any better either. Did the King get his triple double? Good question. I believe this question was asked earlier. Straight hater. Luke need to change the players if they are not doing anything offensively or defensively......unless you are planning to tank..
Now the excuses will pour in for Bullock and Muscle Milk. Waiting to hear the cliches that they are new and need to be integrated. Lol. Other players who moved and had decent performances. Heck, Zu balled out for Clippers along with Landry Shamet. King played like Burger King. LOL!!! The Sixers have added some nice pieces to their team. I think they will win the east and will probably have to face the Warriors. That should be an interesting match up because the Warriors really do not have anybody that can match up against Embiid or the giant they just got from the Clippers. I think the Sixers are the team that is deep. Now which next asset will they dump to get a real center? LOLOL!!! I do not comment on Zo much because I think that his father is his worst enemy. He has a big mouth and is the one who will be responsible if the Lakers decide this summer to let him go to another team to stop the drama caused by his father. You do not go to the news papers or television and try to tell the Laker organization to fire Luke. His son is a good player, but not that good to where the organization has to take Lavar's crap as to what to do with his son or who is at fault. Sorry to say this, LeBron looks old and slow. And if anyone from outer space was watching this game, they would conclude, "Who is that old guy playing next to the teams superstar, Kuzma?" But...they were the right pieces after we dumped SVI and Zu and a second round pick...smdh!!! If LBJ wants to win a ring he should seriously look at philly. Maybe we could trade him for Simmons? Lol. Simmons and Embiid have had some friction according to several reports. Simmons as a laker would be Nooiiice. Lol. LeBron looked like the old guy at a pick up game! And Zu was one rebound away from a double double. Makes me sick. Just to remind you they have Demarcus Cousins. Yes the Warriors do have Cousins, but Embiid is much better player. That man can dominate the painted area, he can shoot the three and has the height and weight to hold his own against most centers now days. Like I said before. I would take him over AD in a minute. I have been watching his games and he is very impressive. If LBJ wants to win a ring he should seriously look at philly. Maybe we could trade him for Simmons? Lol. Simmons and Embiid have had some frictions according to several reports. Yeah, can put next to Zo and see who has the worse shooting night each game. That was trash coaching by Luke. Why take out Rondo? And Start Bullock? AD has won most of their matchups, but I'd take either or even better both !!! Be one hell of a front court. Let's hope GS can't pay Cousins and Lakers aren't stupid enough to pass on him again. Zo is going to Phoenix so we won’t find out. Yeah, I guess he might be this summer, if Suns don't take a PG in draft. The Suns won't need Zo if they get the #2 pick. They'll take that nasty PG from Murray St. That kid is something else. Bullock - 31 mins - 1 rebound, 3 assists, and 2 points. Not stoked on those numbers but we didn't lose too much for him. It's the other trade that bothers me. He only played 13 minutes so it's hard to tell how he is going to fit in, but I know the Zubac would have out on more of a show. 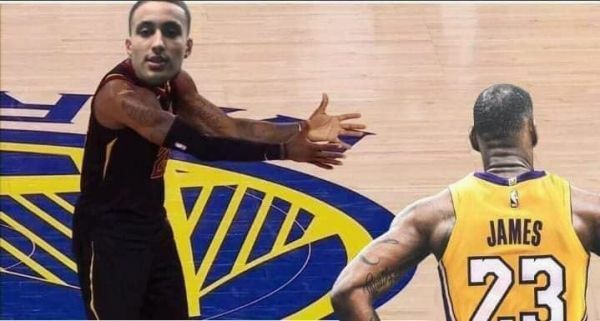 Kuzma 39 points. Not bad for the kid Magic wanted to trade. LMAO! Exactly, that's what I was thinking too. And Kobe 2.0 could have gone for fifty AND A WIN if he weren't benched for six minutes to start the second quarter AND if BI, once in a while, off his horrendous drives PASSED TO AN OPEN KUZ in the corner. Am I seeing a bit of jealousy creeping in? And having ZU instead of Mr. Musicals (who is better suited to a Broadway musical) would have helped too. ADDENDUM: The annoucers have been declaring Kuzma the next big Lakers superstar. As they said, guys who can score 23 points in a quarter are few and far between. PLEASE EXLAIN: WHAT MORON WOULD TRADE ZUBACS FOR MR. MUSICALS? Hasn't Magic learned you don't ever beat Jerry West in a trade? Ever.